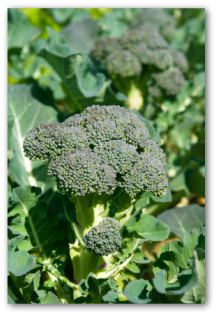 Easy tips for freezing broccoli from your home vegetable garden. Learn how to prepare, blanch and freeze broccoli for winter use in your kitchen. Try our delicious Broccoli and Olives recipe given below, using your home-frozen broccoli and tomatoes. crate or 25 pounds yields 24 pints. If insects are present, soak the vegetable for 30 minutes in a solution of ¼ cup salt per gallon of cold water. Cut off tough ends and leaves. Peel and trim stalks to fit freezer containers. Split stalks so heads are 1 to 1 ½ inches across. Blanch in boiling water for 3 minutes, cool, drain, pack. Vegetable should be cooked 5 to 8 minutes when ready to eat. 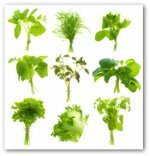 Blanching time of 3 minutes is for 1 ½ inch flowerets with stalks attached. For smaller flowerets, blanch 2 minutes. For peeled, slant cut stems, scald for 1 minute. When packaging broccoli for freezing, the vegetable requires no headspace. Broccoli is one of the best vegetables we have for freezing. You can freeze the vegetable in the standard fashion listed above or separated into batches of flowerets with slanted cut stems, or made into a puree. The directions for these optional methods of freezing broccoli mentioned are given below. Although it is possible to can broccoli, it is not recommended because the vegetable will be dark and mushy. Cut flowerets from broccoli, leaving only the short, small stems attached. 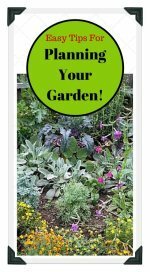 Trim off the leaves and peel the thick skin from the lower, coarse stalks. Soak flowerets and stems separately in salted cold water for 30 minutes if you suspect the presence of insects. Otherwise, omit this step. Slice the stems on the diagonal into ¼ inch thick slices. If very large, divide the flowerets into fairly uniform sections. Blanch and cool the stems and tops separately in small batches. Blanch small flowerets of about one inch across 2 minutes. Blanch the sliced stems 1 minute. Pack flowerets and stem slices separately in freezer containers, leaving no headroom. 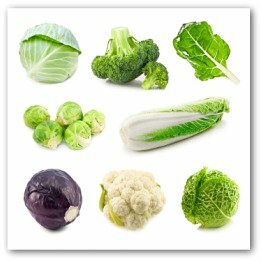 For freezing broccoli to make puree, place sliced, blanched, and cooled stems in a blender and puree until moderately fine. Pack in freezer containers, allowing ½ inch headspace. 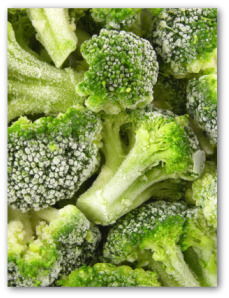 When preparing frozen broccoli for serving, avoid overcooking. Keep in mind that the preliminary blanching has already cooked it partially. Use the flowerets for dishes like broccoli casserole. Stir frying is a delicious way to use the stems. One of the great benefits of using the frozen vegetables in a stir fry is that they do not have to be thawed before cooking in a wok or skillet. 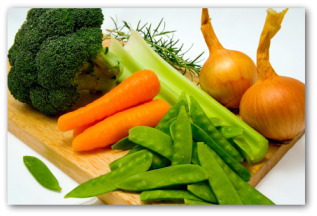 Cook the frozen vegetables alone until the pieces separate and much of the water evaporates. Then oil and seasoning can be added. This prevents the cook from being splattered if the frozen food was directly put into hot oil. Hot broccoli is a classic when served with Hollandaise sauce, and it is almost as good with lemon butter, or vinaigrette containing parsley, minced capers, and a few bits of chopped pimento. The following recipe makes good use of frozen broccoli and frozen tomatoes. Serves 6. 2 pints frozen broccoli flowerets, thawed just until pieces can be separated. In a skillet, heat the oil and cook the garlic for a minute or so without browning. Add the tomatoes and cook uncovered for about 10 minutes. 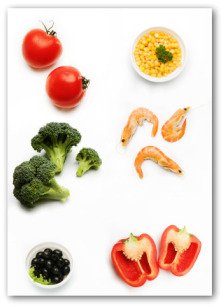 Add the broccoli, corn, peppers, shrimp and olives. Season with salt/pepper to taste. Cover and simmer until broccoli is tender. Serve hot.